After the CBC — Birds and Beer! Following this year’s Christmas Bird Count, members and guests are welcome – counters and noncounters alike – to a warm and friendly get-together at the San Fernando Valley Arts & Cultural Center 18312 Oxnard Street, Tarzana, CA. The idea: to consume pizza and beer, swap Christmas Bird Count data, c elebrate the holiday season and the coming start of 2017! The hour is early so all ages are welcome (but no beer for the kiddies). We’ll provide the pizza and salad (around 5pm), beer ($5 donation appreciated), soft drinks, paper plates and plastic utensils. We’ll set up a projector for anyone wanting to show off photos–bring them on a flash drive. Directions: Located between Lindley and Reseda. In order to park, it is recommended to go south on Etiwanda Avenue and turn into the parking area from the alley behind the center. 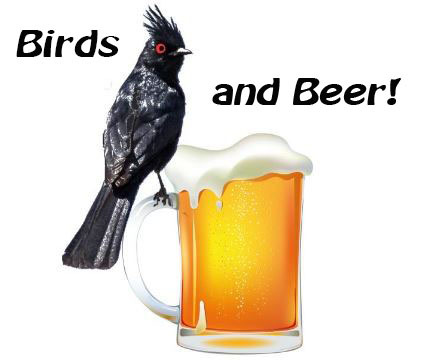 Your ticket for the: After the CBC — Birds and Beer!